(a) Selecting the Commodity: An importer should select the commodity for import after considering various commercial factors as well as legal considerations including the regulations contained in the EXIM Policy. 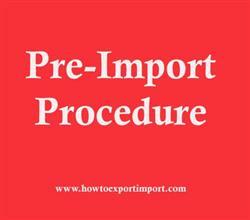 Imports may be made freely except to the extent they are regulated by the provisions of the EX1M Policy. Prohibited goods cannot be imported at all. Import of restricted items is permitted through licensing only while canalised items can be canalised through specified State Trading Enterprises (STEs). (b) Selecting the Overseas Supplier: Imports can be made from any country of the world except Iraq. However, there shall be no ban on the import of items from Iraq in case where the prior approval of the concerned sanction committee of the UN Security Council has been obtained. The information regarding overseas suppliers can be obtained from various, generals, international trade fairs and exhibitions and trade directories Consulate chamber of commerce. (c) Capability and Creditworthiness of Overseas Supplier: Successful completion of an import transaction mainly depends upon of the overseas supplier to fulfil his contract. Therefore it is advisable to verily the creditworthiness of the overseas supplier and his Capacity to fulfil the contract through confidential reports about him from the banks and Indian embassies abroad. It is advisable to finalise contract through indenting agents of overseas suppliers situated in India. (d) Role of Overseas Suppliers Agents in India: Some reputed overseas suppliers have their indenting agents stationed in India. These agents procure orders from the Indian parties and arrange for the supply of goods from their principal abroad. It is advisable to import through such agents as they can be readily contacted in case there is any dispute regarding quality or quantity of goods imported, receipt of payment, documentation formalities, etc. (e) Inquiry, Offer and Counter-offer: It is advisable that before finalising the terms of import order, one should call for the samples or catalogue and other relevant literature and the specifications of the items to be imported. Import of samples of goods is exempted from import duties under 'Geneva' Convention of 7th November 1952. After satisfying himself with the samples and the creditworthiness of the overseas supplier, the importer should proceed to finalise the terms of the contract to be entered into. UserJIF: On 26 April 2017 What if ABC company in Thailand wants to have a toll manufacturer in India to manufacture its product, but using his own raw materials. How do you go about the importation of such raw materials to India? The ABC company has a sister company in India (but as a distributor). Does that need different set of requirements? What are the documents needed? Thank you!